If you are concerned about sun exposure or if you need protection from sun glare, this is a great product for you. These are the new and improved popular Cashel Cap Visor and Cashel Sunbonnet Brim. They are now made from a durable, light weight closed cell foam that provides a safe and superior alternative to conventional visors. 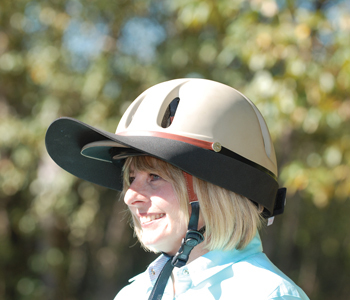 Each visor stretches around your helmet and secures firmly with a hook and loop closure. They easily adjusts to suit your needs. The Cap Visor is lengthened over the face, like a normal visor. The Sunbonnet Brim is a little bit different....it extends over the face 5 1/2 inches AND it extends over the ears 4 inches...for maximum protection from the sun! CASHEL CAP SIZE: 4" or 5.5" visor length. SUNBONNET BRIM SIZE: one size.